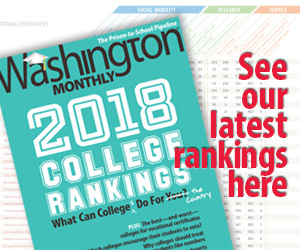 In the Editor’s Note for the March/April/May issue of the Washington Monthly, Paul Glastris discusses the strengths and weaknesses of the “wonkosphere,” as well as a bit of the history of how it emerged around 2000 and has evolved since then. Some of the more recognized wonk-netizens (Ezra Klein, Kevin Drum, Josh Marshall) did early work at the Monthly, and then went on to bring the genre to the strictly digital world. Though, in doing so, according to Glastris, they merged wonkishness (policy) with partisanship (politics) in a way that has become the hallmark of the blogosphere in general. This satisfied a previously unfed audience and quickly changed the quality and character of how policy is covered. It brought some star-power to wonks for the first time. But, even as this new kind of journalism was getting its footing, the old system was decaying. As newsrooms trimmed their staffs to meet budgetary requirements, fewer reporters were working the bureaucratic beat, getting into the weeds of the agencies and breaking stories on how policies were working, or not working. One consequence of this, Glastris argues, is that the problems with the rollout of the ObamaCare insurance exchanges were not detected despite the fact that many people working on them knew things were not on schedule. The traditional media failed to see that one coming, too, as did Congress and the White House, even though documents quickly surfaced showing that plenty of people in the agencies and the contracting companies knew that disaster was brewing. The shriveling of the old media beat reporting system and the government’s shrinking willingness to conduct oversight probably explains this systematic failure. But if the wonkosphere aims to be a better alternative to traditional policy coverage, it needs to broaden its scope of reporting, to have sources not just among academic experts and high-level policy-makers but deeper down in the agencies and other organizations where the rubber of policy meets the road of reality. A second weakness with the online wonkosphere identified by Glastris is that it, like seemingly all journalistic endeavors these days, is too tied to the news cycle. Of course, this is the challenge of journalism in the digital age. How do we get paid? If the New York Times can’t afford a reporter to cover the inner workings of the Department of Health & Human Services, how can we expect Josh Marshall or Ezra Klein to be able to afford it? The audience for untimely policy debate is small and unlikely to create profits for those who provide it. So, I believe the answer here is that we must somehow change the culture of the blogosphere so that the audience gets over their expectation that everything should be free. In the past, readers paid for their information through subscriptions, or indirectly by looking at advertising. Those methods of compensating journalists are generally optional for the reader now, and it’s undermining the quality of reporting that people receive. The lesson is, you get more and better content if you agree to pay for it. If enough people internalize this truth, maybe journalists can get the money and find the patience they need to do the over-the-horizon policy reporting that Glastris wants to see.